Hi there! I'm excited today to take part in my first Tip/Technique Blog Hop as part of theSkipping Stones Design Team. Each team member will share a card along with a tip or technique for designing or even organization. I have a couple of tips in regards to this card. When I'm having trouble coming up with a design idea I'll sometimes flip through my 6x6 patterned paper pads and see if anything sparks my interest. I found this adorable sky with doily clouds and immediately thought of the hot air balloons from the Uplifting set. I'm not the most confident when it comes to coloring so I tend to do a lot of paper piecing just like I did here with the balloons. My #1 tip for paper piecing is to outline your images with a black marker once you've cut them out. It helps to provide a crisp edge that allows the images to really pop. The sentiment is taken from Heartsong 2.
what an amazing tip Jen, I have not ever thought of sifting through my designer paper...I will have to do that. I am a big fan of paper piecing too. Hope you have a n awesome weekend! Love your paper-pieced balloons and appreciate the tip! The doily-like clouds are fabulous! I just LOVE the doily clouds. How creative!!! I love this! Such a cool idea Jen! What a sweet card, Jen! While I have never seen a reason for you to distrust your colouring, but you are an ace at paper-piecing! Terrific card Jen, love the DP! So creative , to use doilies for clouds! 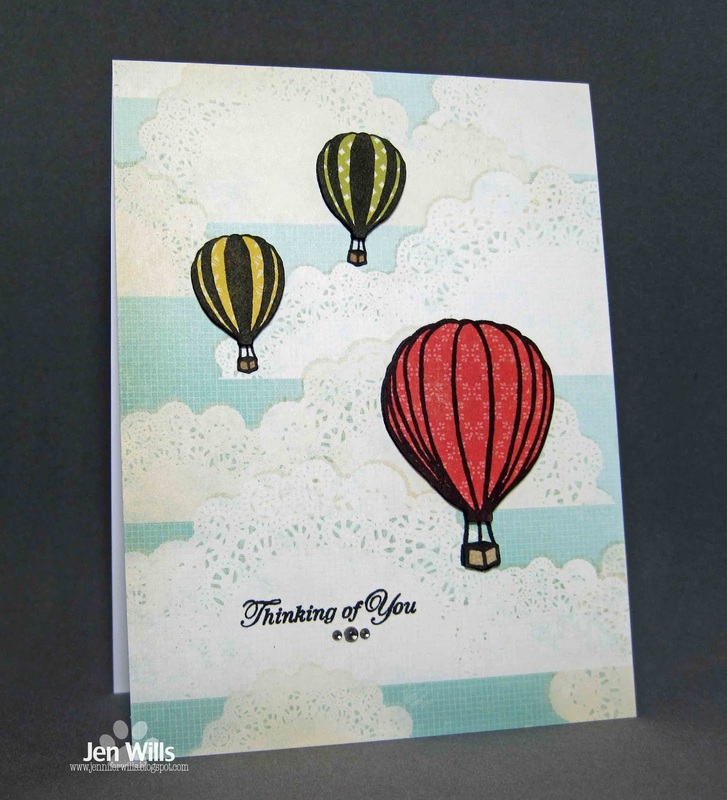 Love those balloons floating in doily clouds!! Love your paper pieced card. That is a great tip about looking through patterned paper. I should try it, since of course, I have a couple of pads to work with. Such a lovely card and that patterned paper is so pretty! I love paper piecing and I find that I don't do it enough. Great tip about going over the cut out image with a marker. I didn't think it made a difference until I forgot to do it and I only noticed it after the card was put together and I could see a big difference.